PROTESIL PUTTY. Condensation silicone of high consistency and viscosity for first impressions in the double impression technique. Protesil Putty is characteristically soft during the working phase, but exhibits an elevated hardness after vulcanisation. 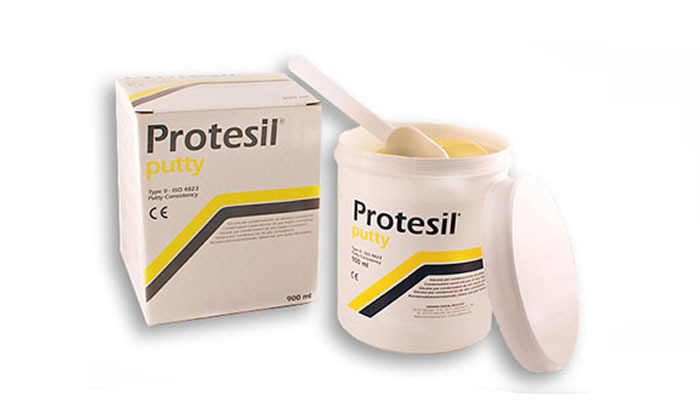 Protesil Putty can be used for all types of impressions, namely, in those used to create dentures, removable dental prostheses and appliances, braces, temporary dental structures, studio models, etc. The product is manufactured in compliance with ISO 4823 and ADA 19.